Very nicely finished "mustang", used for a block in a quilt, used the school color and looks great. Will use it again. 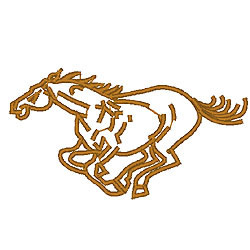 Fireside Threads is happy to present Horse machine embroidery design which has 5915 stitches and is [88.90 mm x 48.26 mm] large. If you would like to view more embroidery patterns please search on our embroidery designs page.